Editor’s Note: This is a re-post from Okunomichi. Please refer to previous posts on Hotsuma Tsutae, especially the initial post, https://okunomichi.wordpress.com/2013/05/17/hotsuma-tsutae/. Briefly, the Hotsuma Tsutae’s first 28 aya were written for Jimmu Tenno (r. 660-585 BCE) by Kushimikatama. 12 additional aya were written under Keiko Tenno (r. 71-130 CE) by Ohtataneko. 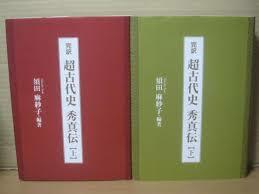 The 40 aya were copied and annotated with kanbun by Waniko Yasutoshi in 1775. The Hotsuma Tsutae was discovered in recent times by Matsumoto Yoshinosuke in 1966. This entry was posted in Hotuma Tutaye and tagged Books on 2019-02-19 by Okunomichi.